The Claughton is recorded as 1161 Sir Robert Turnbull. It must be soon after the engine was completed in 1913, as the lower corners of the buffer-beams are still square — they were cut off quite soon — after one of the first batch clipped the platform at Bletchley, so the story goes. So do we have a closer date and of course the location ? Opening suggestion � between Edge Hill No.2 and No.3 (and No.12) cabins, with the Wapping Goods Lines in the foreground. The train is running on the down South line. The signal on the left in 192 looks like a NE slotted. The signals and the yard lamp match, the gantry in the above kink has gained a subsidiary on one side. 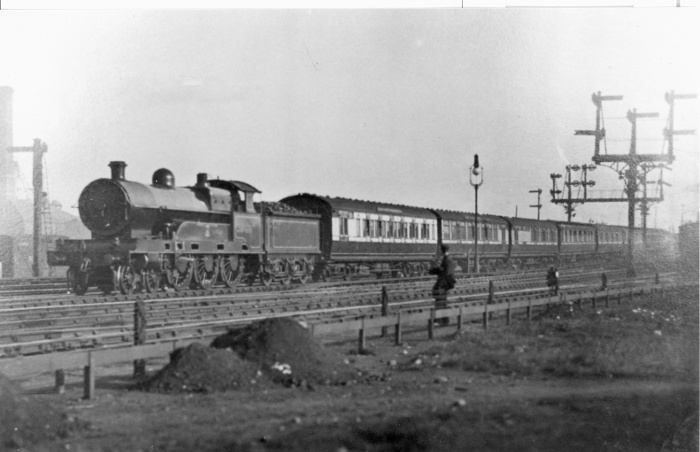 I don�t think it can be Carlisle as the LNWR lines were only two tracks at that point. This seems to be a four-track section with ringed arms on the signals for the slow lines. Also, FWIIW the carriages are LNWR and not WCJS. After studying the Midland Railway distance diagram (enlarged) of Carlisle, I am inclined to favour the diagnosis of Mr Wells. The (single?) line to the right connects to the M&C line from Currock Junction to the M&C Crown Street Goods Station. It is not clear from the diagram how far to the South the tracks of the Citadel Station Committee (Caledonian and LNWR) extended, but it seems likely that most of the lines in the pictures are CSC, not LNWR. The crossover of the connecting line is visible in the picture and the NER signal to the left strengthens the diagnosis. The signal is standing in CSC territory. I think the extent of the Joint Committee property is shown by the RCH Junction Diagrams, of which two reprints have been published. Of course, the CSJC did not have its own signalling department, and the signalboxes (Nos.4, 4A & 5) and signals were supplied by the LNWR from Crewe Works, as can plainly be seen. I think the photo was taken from where the three stop block sidings on the down side join into one. The signals seen are marked by "SP" on the map.